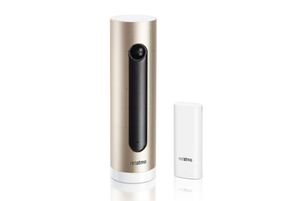 New door/window sensors can trigger Netatmo's Welcome camera to capture a clip and upload it to a Dropbox account. Netatmo made two significant improvements to its Welcome indoor security camera on Tuesday: Sensors are now available that can trigger the camera to record a video sequence when the door or window they’re attached to is opened, and video clips can now be uploaded to the cloud via a partnership with the online storage service Dropbox. The weatherized sensors, dubbed Netatmo Tags, are sold in three packs for $99 each and are available direct from Netatmo as well as from Lowe’s, The Home Depot, Best Buy, and Amazon. The UV-, rain- and wind-resistant sensors connect to your Wi-Fi network and operate indoors or out with line-of-sight range of about 260 feet. The sensors will also send an alert to your smartphone if a door or window is opened, shaken, or even just left ajar. Netatmo's Welcome security camera (left) can now be triggered by door/window sensors dubbed Tags. Dropbox integration, which is free, provides the option of backing up video clips to the cloud. Previously, captured video was stored only on a microSD card inside the camera (leaving it susceptible to theft if a thief saw the camera and had the presence of mind to remove the card or steal the entire camera). Alternatively, Welcome users can store video on a personal ftp server, but that requires uncommon expertise on the part of the camera owner to set up. At the free Dropbox tier, Welcome users will get a maximum of 5GB of storage. An optional 1TB service plan is also available for $10 per month. These are significant upgrades for Welcome owners. Previously, users could tap the camera’s IFTTT integration to capture a still image when an unfamiliar face appeared in front of it, but it could not capture video. There was no support for any other types of sensors aside from the ones built into the camera itself. Netatmo plans to extend IFTTT support to its new Tag sensors, too, so that they will be able to trigger compatible third-party devices. Why this matters: The introduction of door/window sensors to the Netatmo product line leaves us to wonder if the company is planning a broader attack on the smart-home market. A spokesperson declined to say if Netatmo’s new Tags will also be compatible with its upcoming Presence outdoor camera/porch light combo, but she did say that the company was developing new products in three broad categories—the environment, energy, and security—and that these will be introduced over the coming months and at CES in early 2017.